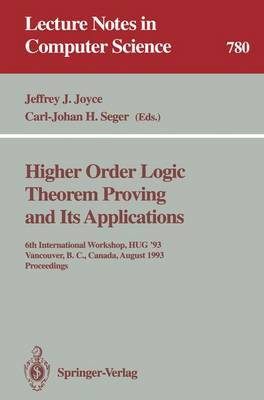 This volume constitutes the refereed proceedings of the 1993 Higher-Order Logic User's Group Workshop, held at the University of British Columbia in August 1993. The workshop was sponsored by the Centre for Integrated Computer System Research. It was the sixth in the series of annual international workshops dedicated to the topic of Higher-Order Logic theorem proving, its usage in the HOL system, and its applications. The volume contains 40 papers, including an invited paper by David Parnas, McMaster University, Canada, entitled "Some theorems we should prove".